More unusual and intense weather patterns define Global Climate Change. The year 2010 tied with 2005 as the warmest year of the global surface temperature record. At the same time, unprecedented flooding is hitting the southern hemisphere, and 70.9 percent of the U.S. is currently covered by snow. The average coverage for this time of year is about 35 percent. Sustainable Book Club discusses Slow Food Nation by Carlo Petrini at the West Tisbury Public Library. Sunday, January 23 at 5:30 p.m.
West Tisbury Library Public Forum, open to all interested in the plans for an expanded library, at the library. Still have produce from your last Community Supported Agriculture pickup? Try these! 1. Heat a Dutch oven or a large pot to medium. Once it's warmed up a bit, add the oil and the cabbage. Cover the pot. 2. Add the vinegar, water, and sugar and combine. 3. Cover and braise in the oven at 325 degrees for 2 hours. Stir every half hour or so. If the liquid completely evaporates, just add a little extra water. 4. Remove from the oven. Uncover and using your hands, break off small chunks of goat cheese and evenly dot the cabbage with it. 1. Add olive oil to a large skillet and saute garlic and shallot until fragrant. 2. Add in butternut squash and saute until cooked through. 3. At the same time, bring 3 cups of water or broth to boil in a large pot. Cook until al dente, about 8 minutes. 4. Drain orzo and add into the skillet with the butternut squash. Top with parmesan cheese. Serve immediately. It's Winter, Time to Walk! The days are growing longer by imperceptible seconds, and the lure of the outdoors is strong. Snow cover on the leafless landscape makes visible the Vineyard’s rolling topography and subtle beauty, and the Vineyard Conservation Society’s winter walks program is in full swing. Last Sunday afternoon the theme was the local impacts of global climate change, and featured a walk to the Wequobsque Cliffs area of Chilmark. There, the coast is taking an unprecedented battering, most visible to the walking public at Lucy Vincent Beach. The clay cliffs west of the LVB are also prone to undermining from saturation from the upland side, resulting in the sort of catastrophic slumping event that struck there last winter. click HERE for a full list of VCS winter walks. 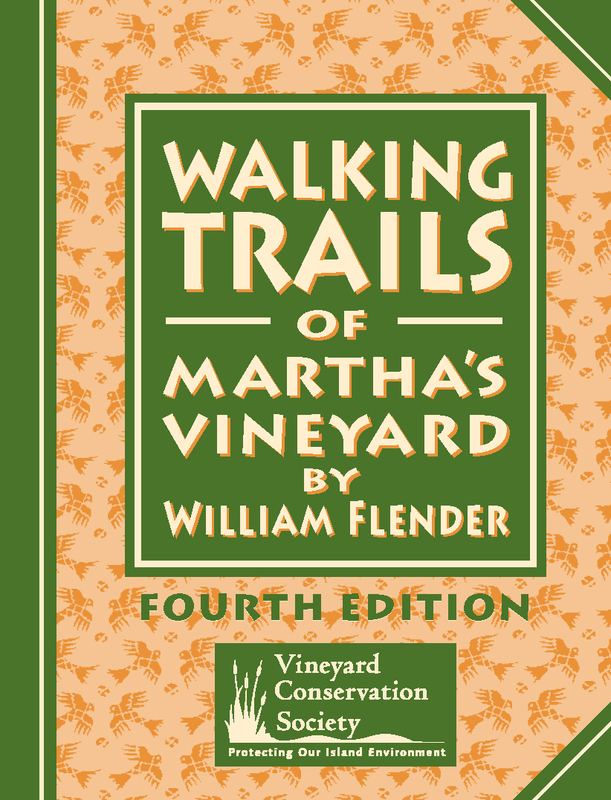 Fifteen years ago, VCS, as part of its advocacy and education mission, teamed up with author and trails enthusiast Will Flender to publish the first edition of Walking Trails of Martha’s Vineyard. It became an instant hit. We are proud to announce that an updated and improved fourth edition is now available in book stores and from VCS. It is an indispensible resource for hikers, bikers, and other lovers of the outdoors on Martha’s Vineyard. One goal in publishing Walking Trails IV is to raise awareness of and respect for the Island’s many publically-accessible, conserved properties. Another purpose is to foster an appreciation of the hard work of the Island’s conservation organizations, working to protect land all over the island. Other VCS publications include Edible Wild Plants of Martha’s Vineyard by Linsey Lee, available at book stores and from VCS. Thanks to all who weighed in on the MV Commission’s DRI checklist revision process. The next Land Use Planning Committee meeting on the subject is scheduled for February 7th. Mountain Top Coal Mining (MTM) began in the United States in the 1960’s. The petroleum crisis of the 1970’s sparked an interest in MTM because it was considered more economical than traditional underground mining. Since then it is estimated that over 1.4 million acres of mountain tops have been destroyed. Most of the MTM in the US occurs in the Appalachian Mountains of West Virginia and Kentucky. Explosives are used to level up to 400 vertical feet of substrate above the coal. Although the Surface Mining Control and Reclamation Act of 1977 mandates that the displaced material be replaced and the mountain top returned to its original state (clearly impossible because the coal is now gone) companies are often granted waivers to use a "topsoil substitute." The remaining fill is conveyed down the mountainside to the valleys below, frequently filling in sensitive habitat and even worse, streams, where permits can be obtained to deposit fill. In addition to poisoning fish and other wildlife, and destroying a healthy habitat on and around the mountain, MTM has serious health impacts on humans resulting from contact with the polluted water supply and airborne toxins from the earth moving and mining. The Environmental Protection Agency has never vetoed any mining permit retroactively. Until this week.